WATERFALL Vincent of Langdene Burgess Hill SUSSEX second lieutenant East Yorkshire regiment and the Royal Flying Corps died 22 August 1914 at Marcq in Belgium Administration LONDON 13 March to Walter Frank Waterfall no occupation. Effects £817 13s 7d. Further grant June 1915. Administration 2 June to Sarah Alice Hammond spinster. Effects £562 6s 3d. WATERFALL Walter Frank of Langdene Mill-road Burgess Hil SUSSEX died 13 March 1915 Probate LONDON 1 April to Sarah Alice Hammond, spinster. Effects £562 6s 3d. 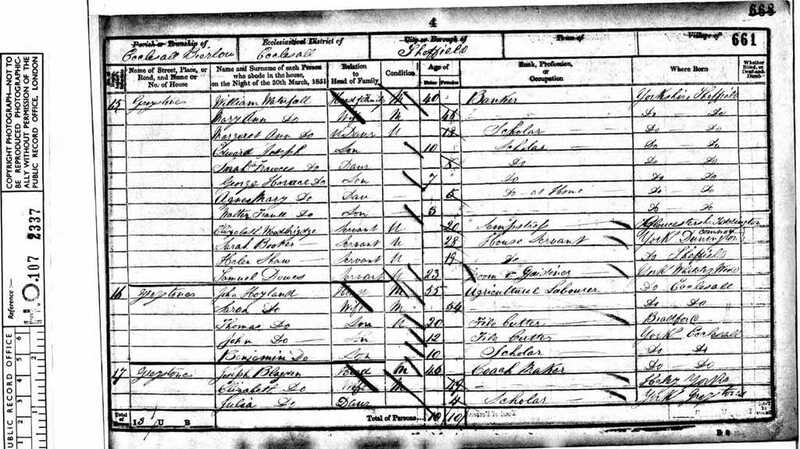 [S3] Birth Indexes, Compiler: General Register Office, June 1847 Ecclesall Bierlow 22 135. 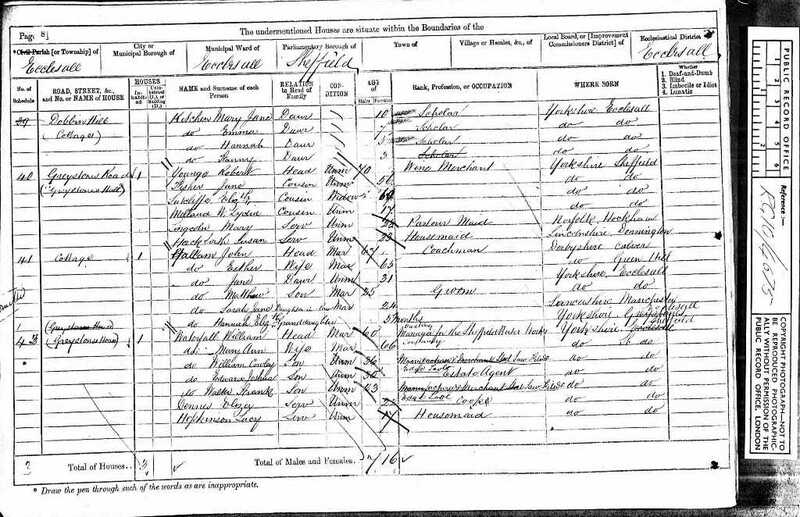 [S6] 1851 England Census , (Ancestry.com), HO107., HO107/2337 Folio: 661 Page: 4 (Reliability: 2). 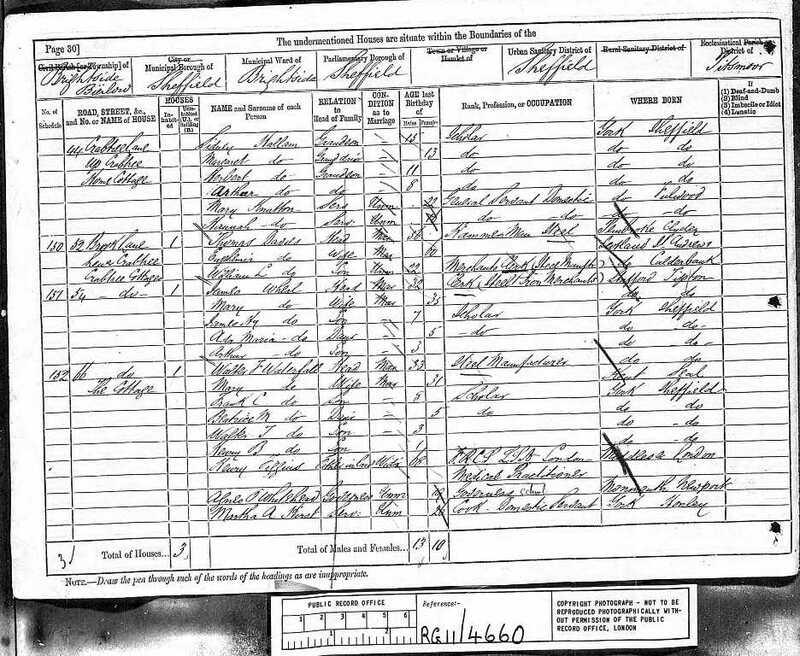 [S8] 1871 England Census, (Ancestry.com), RG10., RG10/4675 Folio: 7 Page: 8 (Reliability: 2). [S9] 1881 England Census, (Ancestry.com), RG11., RG11/4660 Folio: 18 Page: 30 (Reliability: 2). 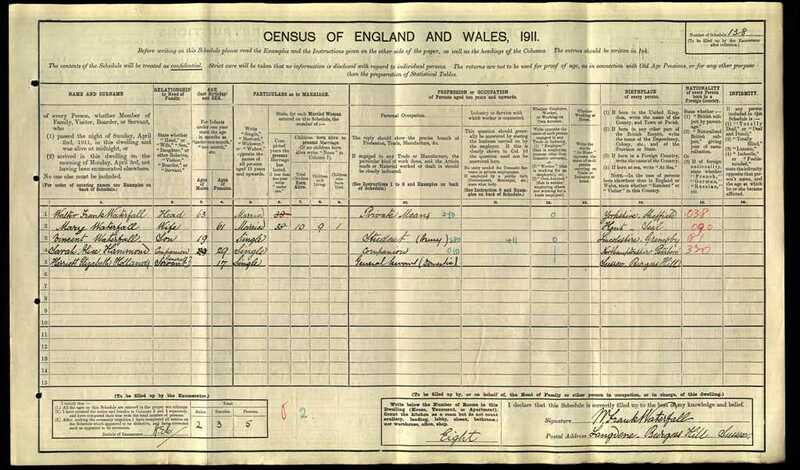 [S10] 1891 England Census, (Ancestry.com), RG12., RG12/2312 Folio: 96 Page: 2 (Reliability: 2). 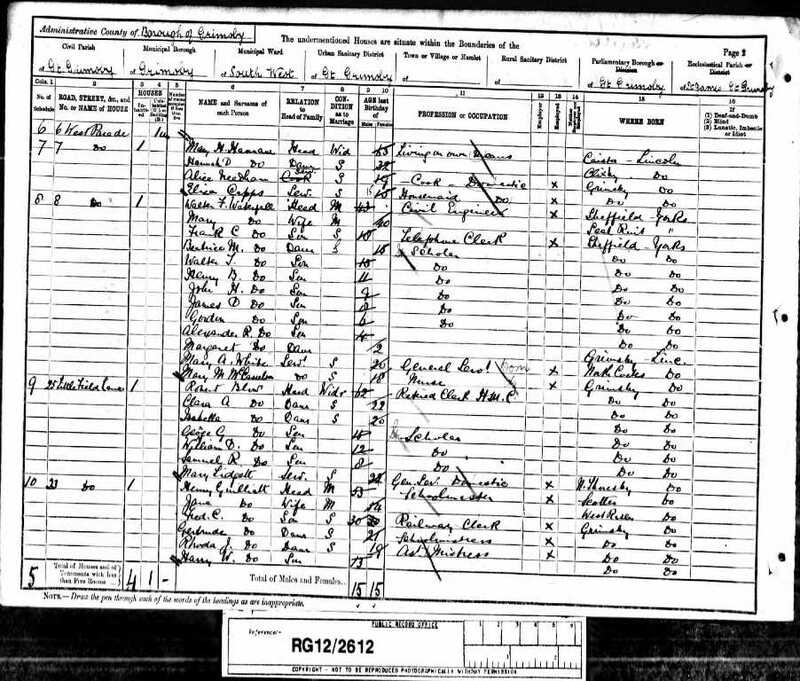 [S11] 1901 Engand Census, (Ancestry.com), RG13., RG13/4347 Folio: 8 Page: 8 (Reliability: 2). 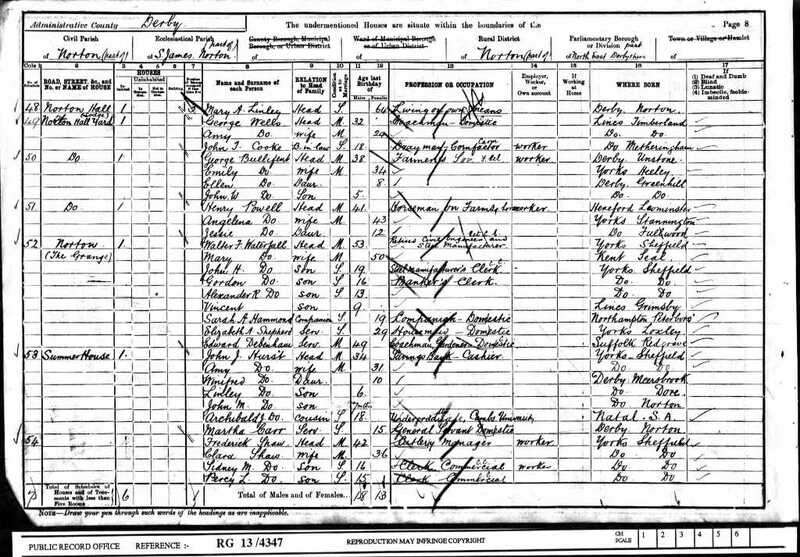 [S18] 1911 England Census, (Ancestry.com), RG14., RG14/5021 RD: 76 SD: Hurstpierpoi ED: 02 SN: 138 (Reliability: 2). [S1] Death Indexes, March 1915 Cuckfield 2b 297 (67 years). [S88] Marriage Licence - Waterfall-Cowley, William WATERFALL, (1832), From Origins.net. [S2] Marriage Indexes, June 1872 Ecclesall B 9c 289.